This is one of the cutest clips I have seen in a while. 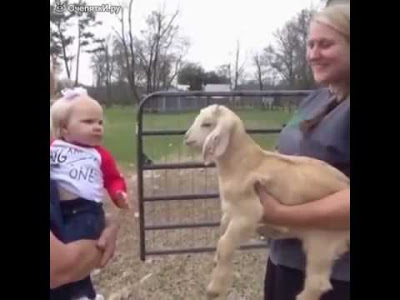 Watching this adorable baby and goat almost makes you think they are actually communicating. I have begun using this clip in presentations when I talk about what children need in terms of relationship building and how that is impacted by technology. Children need real time with real people, anything else is like talking to a goat. Developmental psychologist use the term "serve and return" when they talk about infant learning. A child coos at mom and gets a coo and some interaction in return. This back and forth is a primary point of learning and is essential to healthy development. Children need to talk with, complain to, argue with, and even learn to tease, parents in this dance of conversation. God built us to learn from each other and it all starts with interaction. 2. I am unavailable to you. 3. What I am doing is more important. Children don't need your attention every second. They can certainly survive a necessary phone call or an adult conversation. However, children need to know that you are available. They need you to model healthy behavior such as "humans before technology." And, children need the frequent and incidental interaction that is significantly reduced when humans are looking at screens. A lack of interaction can create a sense of scarcity. When we experience a scarcity of something we really need, we tend to focus on that need. If children are not interacting, everyday with their parents, in small seemingly insignificant ways, they might feel this sense of scarcity. What will they do to replace that interaction? They might turn to technology to feed that need. But relationships with technology is like serve and return with a goat. It is interesting for a while, but it does not substitute for human -- especially family -- interaction. By all means, show your children the blessings of technology, but when you are with your children, put the phone down. Establish some tech free times during your family day so every family member is encouraged to interact with each other. This interaction, even the smallest interaction, even the less than satisfactory interactions, and especially the interactions that you would never want to post on social media, are more important than we can imagine.